Hello again and a belated Happy New Year! 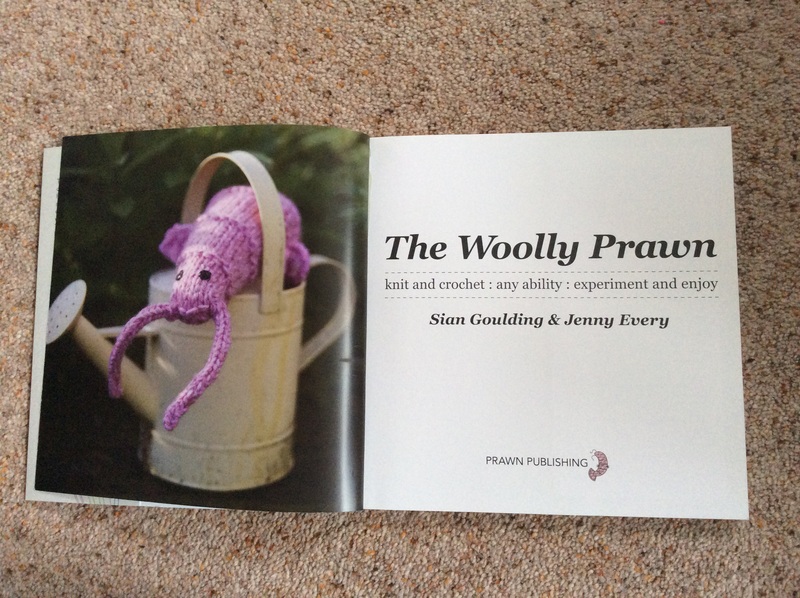 I can’t quite believe that it is five years since my daughter and I published our knitting and crochet book “The Woolly Prawn”. Just before shipping a copy off to America earlier this week I looked at the patterns again and was pleasantly surprised at how many of them are still very current. The features too are as relevant as ever. If you have not seen the book do check it out on Etsy. This is my first post for a while: before Christmas I was busy working on Christmas gifts which, of course, I could not show. Now that I have a bit more time I am getting back into my International Diploma in Crochet course and working on samples to be submitted for Part II. At the moment it’s all about hexagons and diamonds and making them interesting! 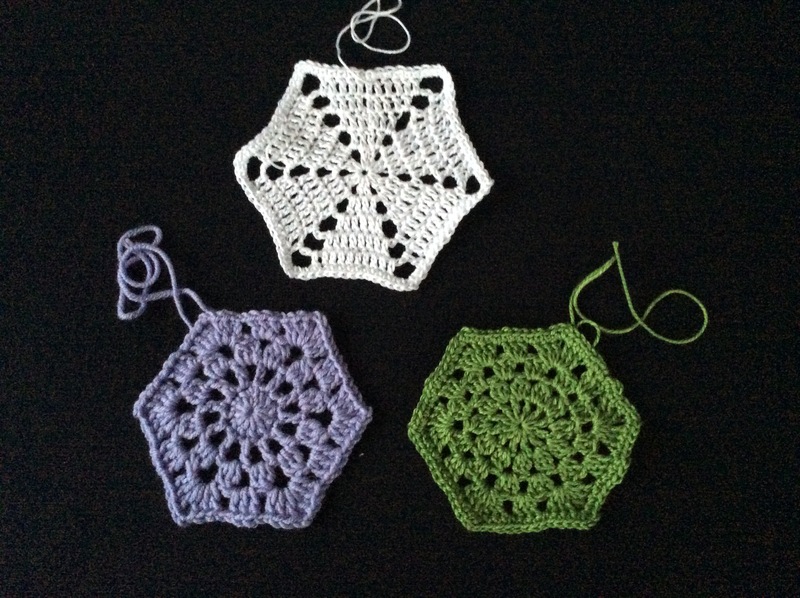 These were my first attempts at hexagons but the corners are not as sharp as I would like. 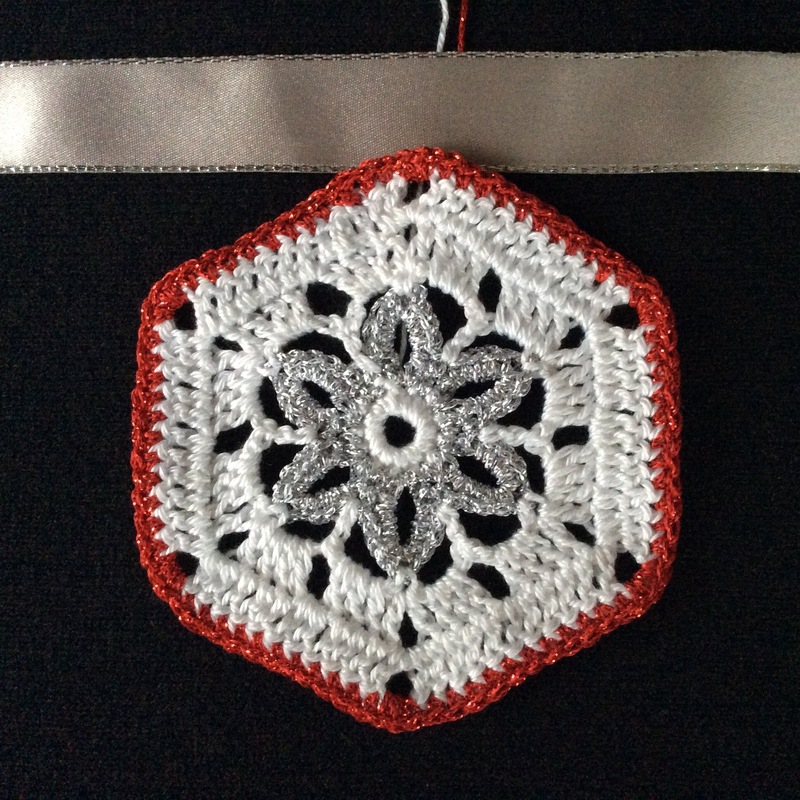 I then came up with the idea of using a snowflake motif inside a hexagonal frame ….. these could be varied in wintry colours and sparkly threads to be joined into Christmassy bunting. So, I have settled on this one to submit. I’m still working on the diamond – so far I have come up with this one worked in the round from the centre. It’s rather large though so I might have to change to a 4ply yarn instead of DK to get a size which could then be combined into a project and I think it needs a yarn which gives better definition such as cotton. The idea is that the sample submitted would act as the tension swatch for an actual item but since this diamond is nearly eight inches long I am not sure what that could be! One of my New Year’s resolutions was to use up some of the huge stash of yarns that I have. Fortunately I found almost enough balls of merino wool in coordinating colours to make a poncho style top which is taking shape nicely. But more of that next time…… and hopefully some photos. For now keep crafting and creating. 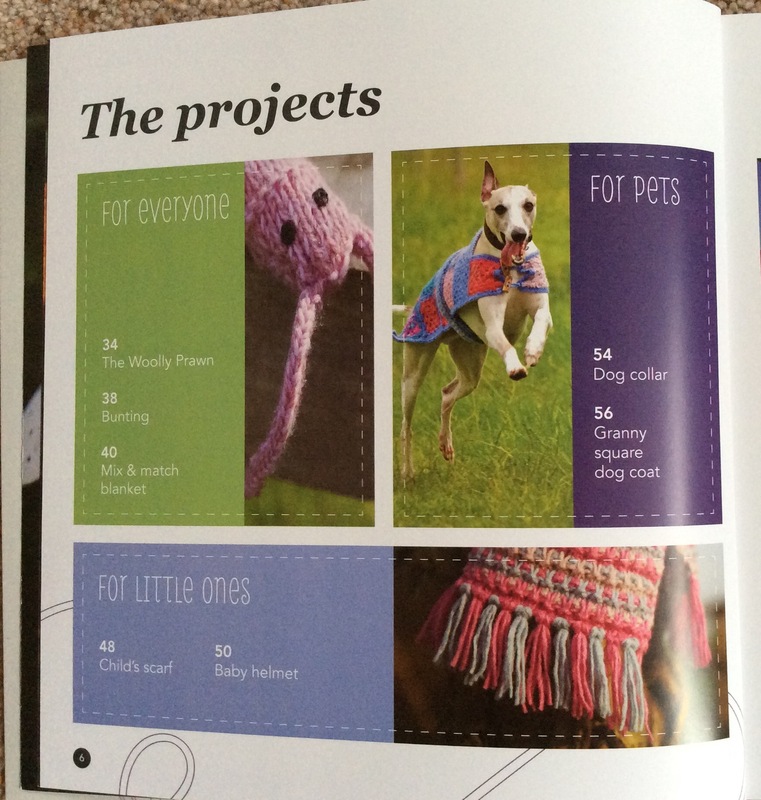 Looks a lovely book Jenny, I did try knitting but it’s crochet for me haha. I like your hegagon and diamond, looks like part 2 of the course is getting very interesting! Hello. I’m Jenny. 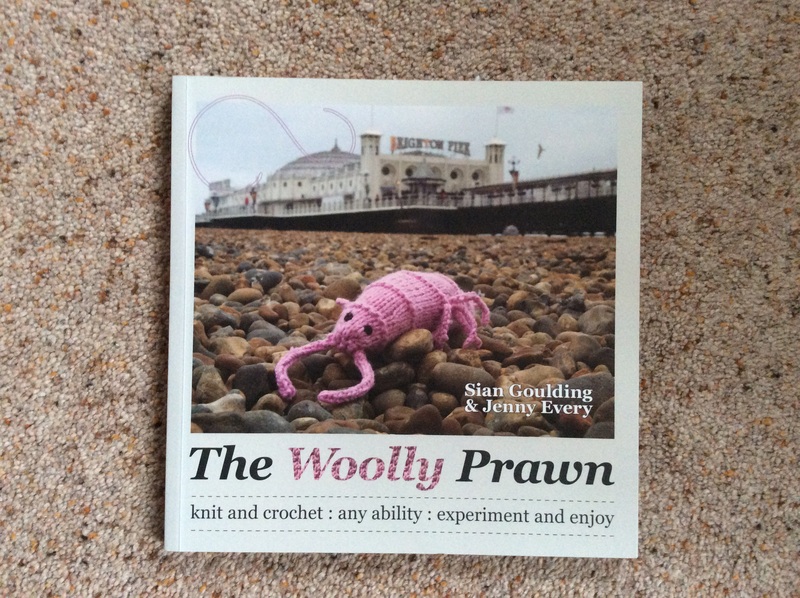 Thank you for reading my blog and for your comments on The Woolly Prawn. Copies are still available and if you “watch this space” there will be a considerable discount later in the year. I haven’t posted for a long time now as other things seemed to get in the way and I was finding it quite time consuming keeping up the blog as well as the IDC course and other projects. Well done for getting to the end of Part 1 – I’ve been looking at your blog and you’re working on some fabulous designs. 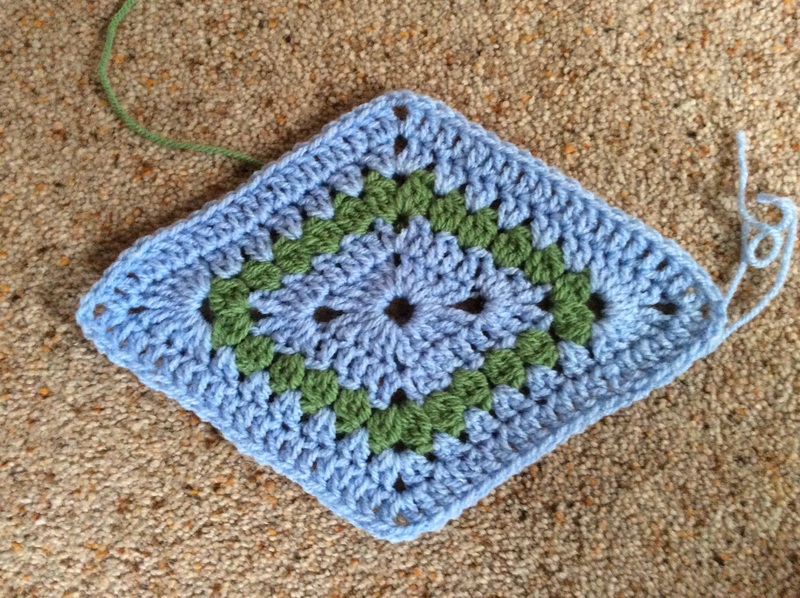 I think Part 2 of the course would suit you as it is aimed at crocheters who want to create their own patterns and designs. The techniques are very much those learned in Part 1 but they have to be developed into “meaningful” samples which could be incorporated into a project. Each of these samples has to be written up as a written pattern, a chart in international symbols and illustrated with design sketches. There are six compulsory projects and both a written and practical exam – I’m not sure when I’ll get to that stage!! At present I’m about half way through the samples and finding it both interesting and challenging but quite time consuming. 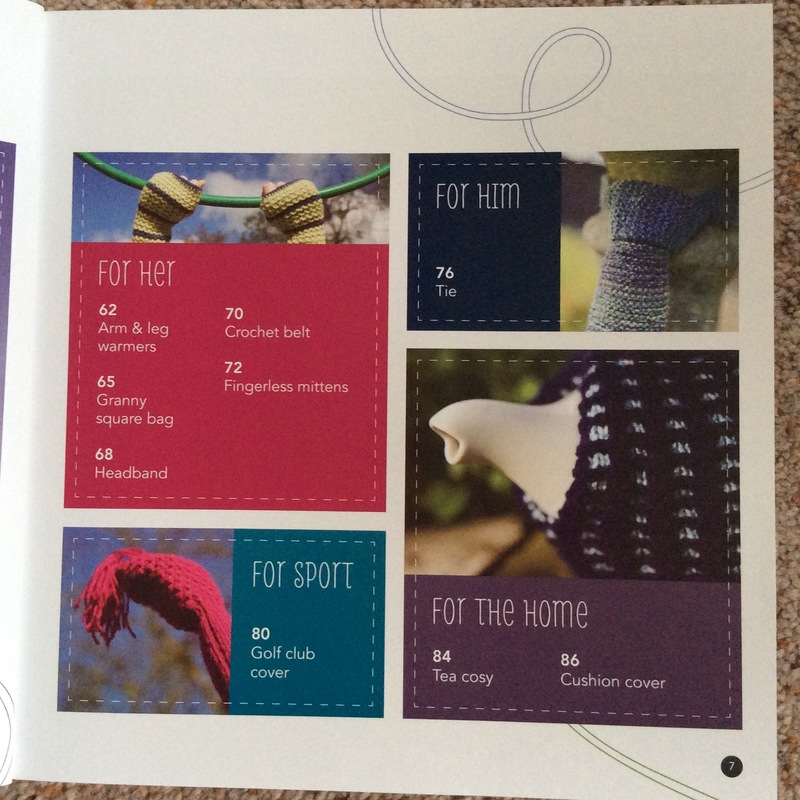 It certainly makes you think about different yarns and shapes and I know from another online crocheter that it is helping her enormously as she makes the transition from passionate crocheter to designer. I’m going to stop prattling on there as I want to reply to your other comments as well. Hope this info is helpful. Hi Jenny, thank you so much for your comments and a bit of insight into part 2 of the course. I think it will be good for me but I’m very undisciplined about making notes and writing down what I have done. Part of my problem recently I that I set myself deadlines and then feel under pressure when other (work or family) things need seeing to. I think I need to take a more relaxed approach to it all. It does sound very worthwhile and certainly gives you direction, doesn’t it?